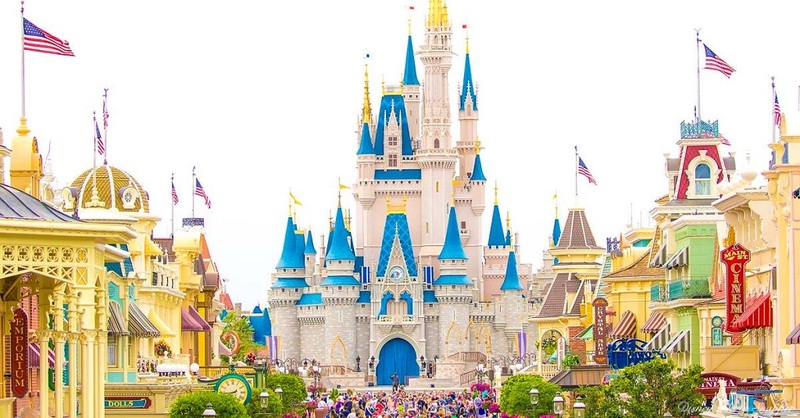 Walt Disney World Magic Kingdom is the first of 4 theme parks built at Walt Disney World in Orlando, Florida. It was opened to the public on October 1st, 1971, 46 years ago, and has remained open, aside from a handful of specific incidents, for the entire time. In 2017, Magic Kingdom was host to over 20 million visitors, making it the most visited theme park in the world...for the 12th year in a row! Today, we’ll learn some of the histories behind this amazing wonderland, and we’ll look forward to the future to see what Magic might be in store! At the time it was opened, Magic Kingdom was actually called Walt Disney World Magic Kingdom, so as to avoid confusion with the Disneyland theme park, which had also been referred to as the Magic Kingdom in that time. However, in 1994, the park was officially named Magic Kingdom Park, and the name has stayed that way ever since. When it was opened, as many of you know and is made obvious by the maps of the Parks, Magic Kingdom was a replica of Disneyland in California, save for a few additions. The original plan for the Magic Kingdom was to have a larger, more spacious, version of Disneyland that would allow for expansion. One of the major additions to the park was Liberty Square, which is unique to Magic Kingdom! The remaining 5 themed “lands” within the park were copies of Disneyland, and they include Main Street, U.S.A., Adventureland, Frontierland, Fantasyland, and Tomorrowland. One fun difference between Disneyland and Magic Kingdom is that the latter is actually built on a series of tunnels, or utilidors, that allow the cast-members to travel below the street! This was actually an idea of Walt’s, as he had been at Disneyland one day and saw a cowboy from Frontierland cross the street and make his way into Tomorrowland. Disturbed by the crossover of themes, Walt was determined to find a way for cast-members to traverse the Park without having to sneak their way around. Voila! Tunnels! Another incredible fact about the Park is that the actual entrance is over a mile away from the parking lot. Now, if you’ve been there, you already knew this, but it’s still a crazy-long way! As with everything Disney, though, this is all by design! Setting up the lot that far away allowed Disney to loop the lot in with their plans for a transit train, ferries, and other amazing transportation plans for the Parks! As for the future of the Park, there are obviously going to be some up-and-coming attractions, but what you maybe didn’t know is, there are plans for a movie about Magic Kingdom in the works! According to Wikipedia, Jon Favreau plans to direct a film, aptly titled “Magic Kingdom”, that will be a Night at the Museum in Magic Kingdom, of sorts. Although Favreau is busy with other projects, he has mentioned in the recent past that he still plans on making the film! How cool would it be to see all of the characters of the Park come alive in one movie?! That’s it for us today! Until next time, Stay Magical!